On behalf of CFS, SES, MFS and SAFECOM, the Emergency Services Leadership Group, has approved SAFECOM sponsoring this event which is being organised by the Don Dunstan Foundation to raise funds for their Mental Health programs. The event is called AdMental and it aims to explore how marketing and advertising can improve mental health and wellbeing specifically for first responders. Multiple advertising agencies will pitch on how to sell wellbeing in relation to “First Responders”. The audience will be given an opportunity to vote on the winning advertisement and will be followed by a panel discussion featuring mental health and marketing experts. Over the last few months the SESVA has actively liaised with both the Minister for Emergency Services and the Shadow Minister over issues that could impact the Sector and looking for support with the lead up to the State Election. Then in February the Chair wrote to the Premier, Leader of the Opposition and Nick Xenophon of SA Best as the three key players in the House of Assembly. Response was received from the Minister and a verbal acknowledgement of being keen to work with us and address our letter from the Shadow Minister. The letters are in the Members Only section for your information. We also mentioned that after the 2014 Election we had the Sector Reform period and that the trust that was eroded is yet to be fully restored. We also wanted better support and recognition for our volunteers. To highlight the service provided we provided a break down of taskings and key events since 2014. Minutes for the 2017 AGM held 12 November 2017 are now available in the Members Only section. New committee member contact details are also now available in our Contact section. Many volunteers have asked what is happening in Victoria and as a consequence your Association has established a section in the Member’s only section, which include many articles which have appeared in the press to date, together with updates from our Victorian counterparts who are also concerned about potential implications. Emergency Services Health is a new, not-for-profit private health insurer that is designed exclusively to enhance the physical and mental health and wellbeing of Australia’s emergency services community. It’s backed by Police Health, extending the quality cover previously police officers and their families could access to our colleagues in the emergency services. As a member of the SASESVA volunteers are eligible to join the fund. For over 80 years now, Police Health has been proud to stand behind the police community, supporting their health and wellbeing. We know what it takes to support people across emergency services. So it’s not surprising that workers and volunteers in emergency services have asked us for the same straightforward and comprehensive cover that police and their families enjoy. Information in the Members’ only section. Individual SES volunteers or a group can apply for an AIDR Volunteer Scholarship, with information, including details of courses available, including Advance Diploma Public Safety (Emergency Management) or a list of many skill sets courses listed in the Members’ only section of the website. Applications close Monday 16th October 2017. 2017 Road Home Art Exhibition. Information for the Special General Meeting is now available in the Members’ only section. 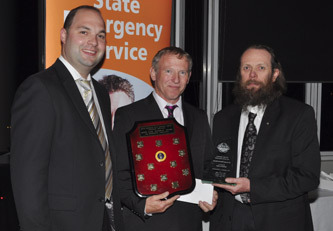 Brian Hunter was presented with his Ministerial ESM by the Hon Peter Malinauskas, Minister for Emergency Services on Wednesday 23 November 2016. Brian is regarded at Metro South as one of the most reliable and inspiring individuals for the way he always gives anything a go. Brian outstandingly meets all criteria for recognition and using words from the nation criteria, he extends tolerance, justice and fairness to all his peers and the community he serves. Congratulations Brian! South Australian residents will be able to help communities affected by natural disasters by making a donation at their local Coles supermarket and showing their support for volunteers who perform critical rescue work across South Australia. From today until Tuesday, 1 November, customersin South Australia can donate to the State Emergency Service Volunteers’ Association at Coles, with funding going towards training and developing volunteersin the event of an emergency and natural disaster. Coles State General Manager Dave Pieterssaid: “We are incredibly grateful for the volunteers who continually rise to the occasion and lead the service at local level, which we saw during the recent flooding and extreme storms. “We’re making it easy for our customers to offer their support by enabling them to donate directly at our checkouts in South Australia,” he said. South Australia’s S.E.S. Volunteers' Association Executive Officer Susan Caracoussis welcomed the support from the community in assisting their efforts in responding to the devastation caused by natural disasters. Congratulations to Tony Sumner, Hallett Unit on receiving an ESM in the Queen’s Birthday Honours. Nominations are being sought for the 2016 Keith Lane Award and information on how to nominate are on the awards page. Nominations close 1 October 2016. Cameron Nolan has been announced as the winner of the 2015 Keith Lane Award. Cameron receives a trophy and $1,000 from the sponsor of the award, the Police Credit Union. Congratulations Cameron. Read more about this year's recipient on the Awards page. This plan articulates how Project Darwin will deliver priority strategies over the coming decade. Its approach has been designed to lead and guide the sector to a ‘future state’ and the priorities are to be delivered in conjunction with continuous improvement of operational and business as usual activities. The strategic plan is a consequence of the decision to put both the Sector Reform under the ESRO model and appointment of a Commissioner on hold, and instead, the COs are now leading the process, which will be actively driven from the centre. Additionally, the ESRO Reference group has been abolished, together with all of the proposed Working Groups, and in their place specific reference structures will be established for each of the priorities. It is imperative that volunteer input will be sought. As such the SASESVA will be submitting a response, to the Strategic Plan, direct to the CE of SAFECOM on behalf of all volunteers. We would welcome your feedback, comments etc, as all information forthcoming will be included in this response, a copy of which will also be posted on the Members Only section of the website. Please feel free to contact one of your Association representatives and we will endeavour to answer any questions posed or ensure the information is obtained. Response has been so overwhelming that have already issued 95% of our annual allocation of passes. We know from some of the comments received that the passes are certainly appreciated and put to good use, so to those volunteers who have received a pass, please enjoy and ensure that all the conditions set by DEWNR are adhered to. Plus a reminder, if you change your vehicle, please let DEWNR know, and a replacement pass will be issued with your new vehicle registration details. It is important that this is done and not left until the following year, as between the SES and CFS this caused some delays with processing due to the number involved. The SASESVA has issued a warning to the community to be wary of opportunistic scammers claiming to be seeking donations on behalf of the SES. Phoning seek donations is not something that either the State Emergency Service or the Volunteers Association do. People need to be wary fundraising in this manner. Regrettably scammers always seem to prey on community generosity, especially in the wake of disaster and typically endeavour to catch out people who genuinely want to help others. If people are suspicious they should report the matter to the police. With the demise of Frontline, due to loss of the non SES funding support, we are unable to continue its production and distribution at the present time. To fill its void, we have introduced a section, Around the Units, where any stories or photographs forwarded to us, will be uploaded as received. Of course, this section can be expanded to include other items of interest and suggestions are most welcome. Congratulations to James Trevlyn Smith, Streaky Bay Unit on receiving an ESM and to April Young for being named Salisbury’s Citizen of the Year. Documents for the 2015 AGM including draft agenda are now available in the members section. Congratulations to John Trigge (Mt Barker Unit) and John Edge (Yankalilla Unit) for winning the “Last Cab to Darwin” movie tickets courtesy of Icon Film Distributors. As we receive more tickets, we will let volunteers know via the website. Jet Flight Simulator supports SES volunteers. Sample voucher and discount details can be located in the members section. The 2015 recipient of the Keith Lane Award will be presented with his/her award at the Annual SASESVA Awards Dinner being held at the Adelaide Sailing Club on Saturday 24 October. 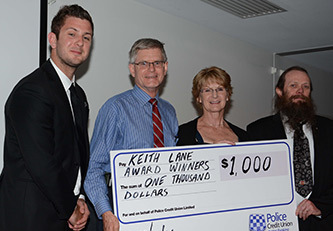 So nominate that worthy recipient now – details in the Keith Lane Award section. Features a number of our vollies from units in Adelaide’s east. Filmed at Morialta Conservation Park. Thanks to Brenton Clarke and Michael Baker for helping make this happen. Around 200,000 viewers saw this last night. 02/12/2014 - Much has occurred over the last month and the Minister is now moving to the next phase, with the appointment of his Project Team and the Reference Group where SES volunteers will be represented by 3 members. This means that any concerns will still be raised and that at all times we will be fighting for volunteers and the communities they support. To this end, all papers sent to volunteers are to be included in a folder “Sector Reform” in the Members only section. These will include papers emailed to all volunteers and other communiques. 24/10/14 - Chris Tarran and John Lawrencehave been announced as joint winners of the 2014 Keith Lane Award. They will each receive an individual trophy and shared $1,000 from the sponsor of the award, the Police Credit Union. Read more about the recipients on the Awards page. 26/08/2014 - An advertising campaign to educate motorists that they will be required to travel at 25km/h past stationary emergency service vehicles showing blue and red flashing lights commenced on Sunday, 17 August 2014. Advertisements, which feature Hallett SES Unit's Shona Mayne and representatives from the four other emergency service agencies, are to appear in newspapers, bus shelters and digital advertising. Radio advertisements are also part of the campaign. The new law is effective from Monday, 1 September 2014. The August 2014 edition of the Frontline magazine is now out and available for reading right here on our website. Remember you can read any back issue at any time in the Frontline section. Annual General Meeting Saturday 8 November 2014 Papers and nominations forms are now available to members. 05/10/14 - From Thursday 9 October until Monday 27 October on presentation of your ID card. Details in the members only section. 23/07/14 - SASES Volunteer National Park Pass benefits 2014/15 Information is now available in the members section Please Note only 200 passes are allocated to SES volunteers and over 100 have already been issued. 23/07/14 - Nominations are now being sought for the 2014 Keith Lane award, which is again being sponsored by the Police Credit Union. Nominate that volunteer who you believes goes beyond the call of duty in the roles he/she undertakes. 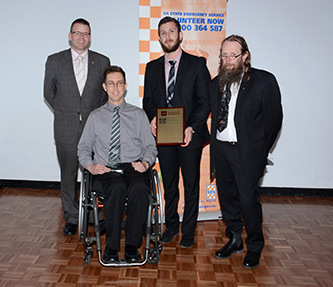 The award will be presented at the Annual Awards Dinner to be held on Saturday 18 October 2014 at the Adelaide Convention Centre. The April 2014 edition of the Frontline magazine is now out and available for reading right here on our website. Remember you can read any back issue at any time in the Frontline section. 24/03/14 - The January 2014 edition of the Frontline magazine is now out and available for reading right here on our website. Remember you can read any back issue at any time in the Frontline section. 26/11/13 - Gavin Tunks wins the 2013 Keith Lane Award. Read more about the recipient on the Awards page. Congratulations Gavin! 30/10/13 - The Agenda for November's AGM is now available in the Members Only section..
04/10/13 - If you've experienced a traumatic situation and need to talk it through, call the Stress Prevention and Management (SPAM) helpline for SA Emergency Services volunteers. Watch the SPAM video in our Videos section. 03/08/13 - The July 2013 edition of the Frontline magazine is now out and available for reading right here on our website. Remember you can read any back issue at any time in the Frontline section. The forthcoming SASES Unit Managers Forum is shaping up to be the best ever! A Unit Managers Forum Working Group was established by the Chief Officer to put together a package that better meets the needs of the service and its members. With representation from SASES volunteers, staff and the Volunteers Association, the working group has been working together to plan a forum that will provide the best possible value to attendees. The Unit Managers Forum 2013 will be held on 26 - 27 October at the new state-of-the-art Police Academy in Taperoo. 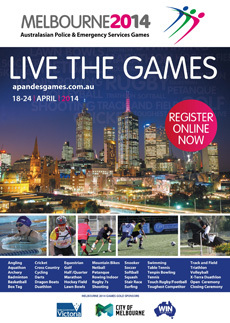 I am delighted to invite competitors from all eligible Police and Emergency Service agencies from throughout Australasia to the Melbourne 2014 Australasian Police & Emergency Services Games to be conducted between 19-24 April, 2014. It is our mission to utilise the best available sporting venues for the 50 plus sporting disciplines on offer and to provide a social environment to perpetuate the tradition of friendly competition and inter-agency camaraderie. The Melbourne Sports and Aquatic Centre will provide international standard facilities for swimming, badminton, basketball, volleyball, squash and table tennis. The new Lakeside Athletics Stadium will host track & field with the picturesque parklands around Albert Park and the nearby bay beaches becoming home to an array of other sports. Some sports such as surfing, angling, mountain bikes and shooting disciplines due to their very nature will be held in regional centres. Competition is in open and age graded categories catering for all levels of ability. 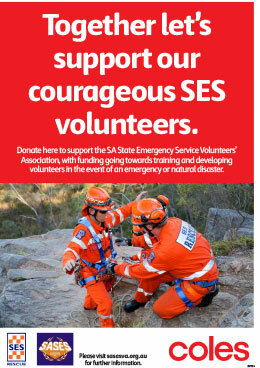 30/06/13 - Your World Fitness supports SES Volunteers. To find information on the offer and services provided, go to the Members Only section of the website. 16/06/13 - The Department of Environment Water and natural Resources has continued its partnership with the Association and is again providing a limited number of National Park Pass Cards to SES volunteers. This partnership is really appreciated by our volunteers and we thank DEWNR for its ongoing support. Information and application form is available for downloading in the Members Only section. 16/05/13 - Details and voucher in the Members only section. Offer valid from Thursday 16th May to Monday 3rd June. 07/05/13 - Are you aware of a project or initiative that makes the community safer, stronger, more resilient and better prepared to manage any emergency situation? What have you achieved that may inspire and benefit other communities? 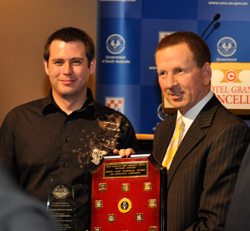 The 2013 Resilient Australia Awards may be the perfect way to promote and recognise this project. 02/03/13 - The April 2013 edition of the Frontline magazine is now out and available for reading right here on our website. Remember you can read any back issue at any time in the Frontline section. 02/03/13 - The January 2013 edition of the Frontline magazine is now out and available for reading right here on our website. Remember you can read any back issue at any time in the Frontline section. 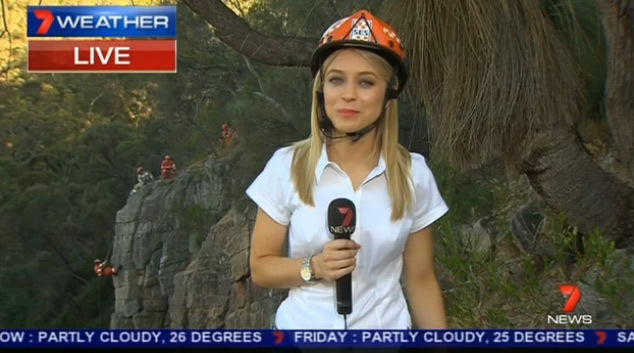 23/12/12 - Check out the new SES recruitment video, filmed at South Coast SES unit, focusing on road crash training. You can view it via our newly launched Videos section. 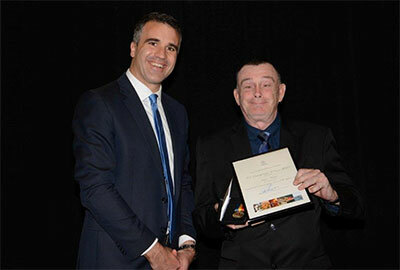 3/11/12 - Bob Bowley wins 2012 Keith Lane Award. 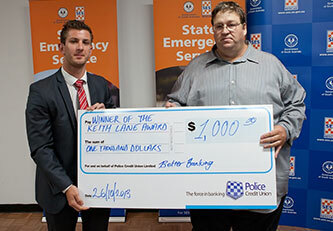 Congratulations to Bob and the SASESVA is also delighted to announce that the Police Credit Union has agreed to again sponsor the 2013 Keith Lane Award by presenting the recipient with $1,000. 18/10/12 - Kathmandu offer to SES Volunteers during the period Thursday 25 October to Thursday 11 November. Voucher in members only section. 30/05/12 - NUTS ABOUT FOOD supports SES volunteers. The company specialises in nuts, beans, seeds, snacks, confectionary and groceries. For full details go to the members only section. 3/11/12 - The Association currently has some casual vacancies on its committee, as a consequence of changes to our constitution in August to reflect the SASES restructure. As a result it was agreed that the fairest option was to call for nomination and the form may be downloaded from the members section. Should anyone be interested in joining the committee please nominate and if they have any questions, please give me a call. A lot of committee work is undertaken via email and telephone. We meet face to face 3 weekends per annum and hold teleconferences on a Friday evening so as not to clash with training. 23/10/12 -The October 2012 edition of the Frontline magazine is now out and available for reading right here on our website. Remember you can read any back issue at any time in the Frontline section. 24/09/12 - Annual General Meeting of the SASESVA will be held on Sunday 21st October at 2.30p.m. 24/09/12 - Reminder nominations for the 2012 Keith Lane Award close on Friday 12th October 2012. 15/08/12 - Frontline is back! Our July 2012 issue is now available for reading right here on our website. Remember you can read any back issue at any time in the Frontline section. 28/07/12 - An extraordinary meeting of the SASESVA is being held to amend our constitution to reflect the Region and Administrative changes that have implemented by the SASES. Voting is by ballot paper with the returning date for votes being by close of business on Friday 31st August 2012. The Agenda, Ballot Paper and Proxy can be downloaded from the Members Only section of the website. 08/05/12 - A new set of photos from the Dog Operations Unit are now available in the image gallery. 03/05/12 - The SES Volunteers Charter aims to promote the interests of SES volunteers when decisions directly affecting their interests are made. The Charter is being reviewed by the Volunteer Services Branch of SAFECOM, with feedback being sought from SES volunteers, the SES Volunteer Association, SES staff and SAFECOM staff. any examples of where the charter has not worked to ensure the best outcomes for volunteers. 13/04/12 - Michelina Guarna has established GUARNA LEGAL and is pleased to support the SES by offering the firm’s legal services at a preferential rate to SES members and their families. In addition to offering a 10% discount off its normal charge out rate, the firm offers a free 15 minute telephone advice service to members and their families. If you need to talk to a lawyer, call Michelina Guarna on (08) 8373 6473. The firm’s office is located at 140 Greenhill Road, (corner Unley Road), Unley. 02/04/12 - The April 2012 edition of the Frontline magazine is out now. As this will be the last edition of Frontline, we will soon be setting up a section for "Around The Units" on the website. Stay tuned and we'll keep you posted. 02/01/12 - The January 2012 edition of the Frontline magazine is now out and available for reading right here on our website. Remember you can read any back issue at any time in the Frontline section. 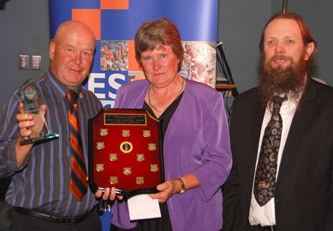 16/11/11 - Colin and Judy Schriever have been announced as joint winners of the 2011 Keith Lane Award. Click Here to learn more about the inspirational work they've performed for the SES Strathalbyn Unit. Congratulations Colin and Judy! 2/11/11 - This discussion paper was compiled by a CFS Group Officer, who also happens to be a SES Unit Manager. The paper is a solution to problems that may exist in the Onkaparinga are, only and as such would not necessarily work in all regions. These discussions are in the initial stages only and we seek feedback from volunteers on which way we should address the paper. We are most disappointed that this paper has been distributed without background being provided to SES volunteers due to the fact that in some areas closer working relationships are already exist. 18/10/11 - E-mergency Connect Program launches a new communication website for information about the Program and its interrelated Projects. Content includes, answers to frequently asked questions and a members log in section for more information such as the governance and key dates. 08/10/11 - Just uploaded: 5500+ photographs from this year's National Disaster Rescue Competition. Check out the extensive set now in our Image Gallery section. 22/09/11 - The October 2011 edition of the Frontline magazine is now out and available for reading right here on our website. Remember you can read any back issue at any time in the Frontline section. 30/08/11 - The 2011 Annual General Meeting agenda, nomination form and proxy form are now available for download to our members. Login at the Members section to grab the papers. 30/06/11 - The July 2011 edition of the Frontline magazine is now out and available for reading right here on our website. Remember you can read any back issue at any time in the Frontline section. 21/03/11 - Our members section now houses the SASES Directives, Policies and Procedures, including Group 1 Consultation Documents in Draft. Click on the new tab in the Members section to access them. New National Parks Passes documents are also now available. 16/03/11 - We've introduced a new section on the website for the National Disaster Rescue Competition (NDRC), to be held in July at the Adelaide Showgrounds. Further information will be available on this page in the coming months. 22/03/11 - The April 2011 edition of the Frontline magazine is now out and available for reading right here on our website. Remember you can read any back issue at any time in the Frontline section. 07/03/11 - New items have been added to our Merchandise section. There are three different waistbags available for purchase. Fill out the order form to get yours today. 10/01/11 - Consultation has been extended til 30 April 2011. Responses to the Association for compilation into a paper would be appreciated. Check Members section for all the files. 21/12/10 - The December 2010 edition of the Frontline magazine is now out and available for reading right here on our website. Remember you can read any back issue at any time in the Frontline section. 15/11/10 - Paddy the Platypus, the FloodSafe mascot, is now available as a 28cm soft plush toy, as pictured. His name appears on his overalls and the SES logo is on the overalls, sleeve and helmet. As seen in our Merchandise section, Paddy is being sold for $20 and can be used as giveaway, gift or sold as a part of a promotional activity. 27/9/10 - The October 2010 edition of the Frontline magazine is now out and available for reading right here on our website. Remember you can read any back issue at any time in the Frontline section. 7/9/10 - Paddy the Platypus, the FloodSafe mascot, will soon be available as a 28cm soft plush toy. As can be seen from the photographs, his name appears on his overalls with the SES logo on the overalls, sleeve and helmet. As seen in our Merchandise section, Paddy will be sold for $20 and can be used as giveaway, gift or sold as a part of a promotional activity. Orders can be placed by emailing the Association. 31/8/10 - To allow for a change which enables all volunteers to access the Members section, from today your login will now be your SES Membership ID followed by your surname as your password. If you are still having troubles logging in please contact Susan Caracoussis. 08/7/10 - SES Training 'Green' paper and introductory letter are now available in the Members section of our website. 24/6/10 - The July 2010 edition of the Frontline magazine is now out and available for reading right here on our website. Remember you can read any back issue at any time in the Frontline section. 19/6/10 - SES volunteers have been offered a discount at Plantmark wholesale nursery. Upon presentation of their id card they will get the same discount as if they had a green pass card at the nursery. For more information and the location, they can check out the Greenpass website. 4/6/10 - The SES consultation paper is now available for our members. 1/4/10 - The April 2010 edition of the Frontline magazine is now out and available for reading right here on our website. Remember you can read any back issue at any time in the Frontline section. SES Volunteer Parks Passes will be distributed on a "first-in" basis to SES Volunteers who apply. The intent of the Parks Pass is to recognise the direct relationship between the SES and our National Parks. You can find further details and an application form in the Members section.